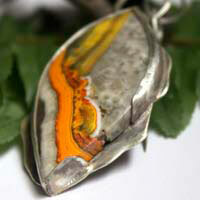 Bumblebee is a stone that can be called jasper as well as agate. Actually, it does not really belong to one or the other. The reason is that there is not a right category for this stone. 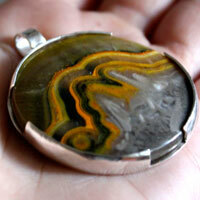 However, it seems that it would be better to say jasper instead of agate. It is not a real jasper as it lacks silica, quartz and moganite. 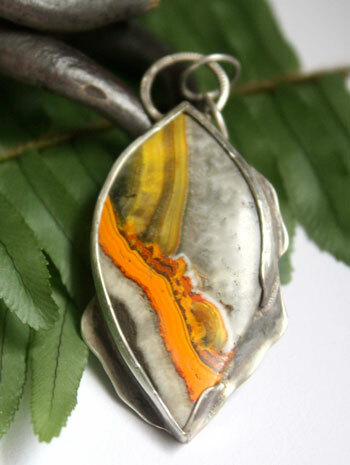 In the same way, its composition does not fit with the agate composition. However, jasper is still the most correct word even if it is not enough because it is made of a sediment rock and that the creative process is very similar to jaspers. This stone shows orange, yellow and black wavy bands. This sequence of colors reminded quickly of the similarity with bees. It is mainly composed of volcanic ashes layers (with gypse, angelite, orpiment, arsenic sulfur and hematite) as well as sulfur layers. It would be a seasonal geology formation. Indeed, this mineral compression happens during the rainy season in mud holes. There would be a mix of layers made of ashes and sulfur. They would stick together due the pressure and the volcanic heat. Indigenes who are excavating this area would call it "batu badar blerang" that means "coal becoming sulfur". This idea must come from black lines that transform themselves into yellow lines. It became quite popular at the end of the 1990s when a local sent a sample in Arizona to geology fair. As it has a recent history, we could not find anything to tell about this stone. Bumblebee would help relieving cramps, especially in the legs. It would help with insomnia problems. Because of the sulfur, it would protect from insects.